This mutation has the same color pattern as the India Blue male. 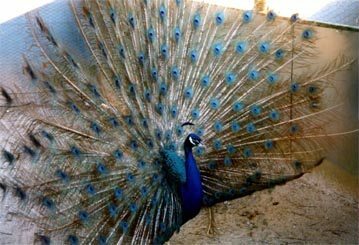 The crest, head, and neck are a deeper blue than the India Blue, and show a distinct purple irradiance when in direct sunlight. The primary wing feathers are dark brown and the barred feathers are a creamy tan much like the Cameo. 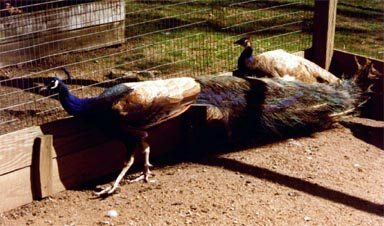 The saddle and train are lighter than the India Blue in color, also showing a distinct purple irradiance when in direct sunlight. Purple bred to Purple breed true.